Tracy's Notebook of Style: Weekend Style Notebook: under $30 + 9 Style Must-Have's! 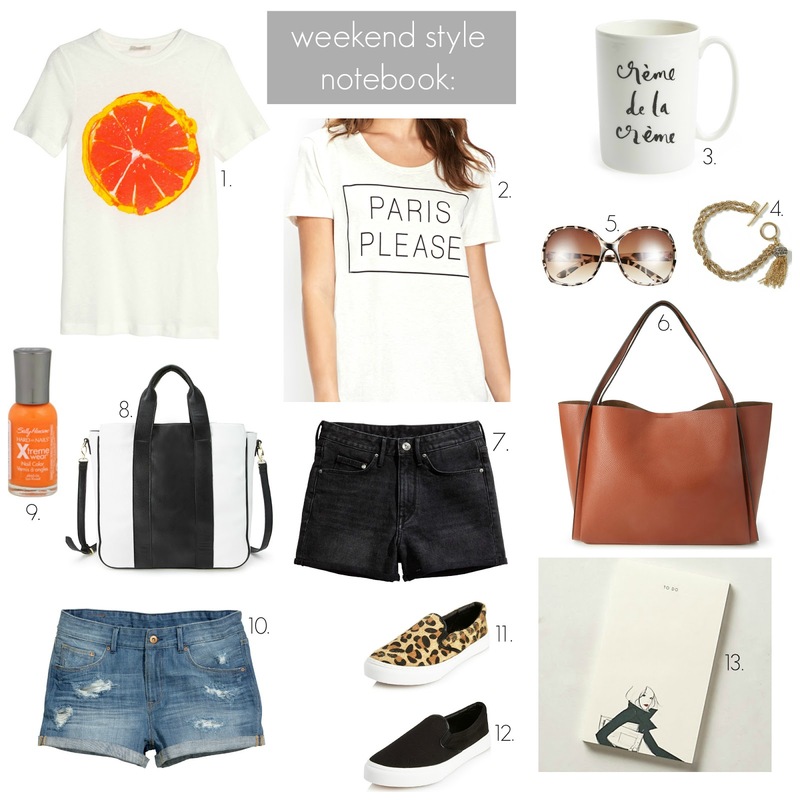 Weekend Style Notebook: under $30 + 9 Style Must-Have's! I'm always on the hunt for some easy and chic ways to look pulled together and this weekend look was inspired by both J.Crew and Madewell's catalog outfits. While even their statement tees can be on the pricier side (even on sale! ), you can always seek out style for way less. 1 Statement Tees There is nothing more casual chic than a good statement tee, bonus points for finding french-inspired versions or pineapple/citrus t-shirts. 2 Denim Shorts Any style looks effortless, yet still chic. Right now, distressed denim shorts are trending thanks to the popular Rag & Bone's $200 version. 3 Slip-On Shoes You cannot get through the summer without at least one pair and why would you want to? They are stylish, comfortable and affordable and can be worn with just about everything. 5 Oversized Sunnies Celebrities wear these for a reason, they're just cool. 6 Tassel Jewelry Try a bracelet or necklace to get in on a very chic trend. 7 Cute Statement Mugs Okay, so this isn't a trend someone will necessary see, but for any bloggers out there, this is a must-have for your morning photos, LOL. I do think having a chic mug starts your day off right and naturally Kate Spade has done it again. 8 Cute Notepad I looove stationary and picking up a few fun notepads (even from the dollar section at Target) will make list-making more enjoyable...trust me. 9 Bright Nail Polish Citrus colors and neons are everywhere right now, pick up a few $2 bottles at Target and save your money for a splurge item instead. Love everything here but adore the orange tee and the tan bag! The orange tee is so bright and fun and can't beat the look of the bag! Great picks! I'm all about that orange tee and the F21 one also, I may as well buy them both :D. I bought the necklace version of the BR tassel bracelet during the memorial sale. I know it's not on sale, but I love all the bright colors from Butter London right now. love love!!! PARIS, PLEASE! and a creme de la creme mug is a necessity. Buying both now! I love all your picks!! <3 I especially want to get one of those tassel bracelets and jump on the tassel bandwagon! =) lol. Did you get a chance to try on those sneakers from F21?? They're exactly what I'm looking for, but I hate going INTO the store and worry that they'd be super uncomfortable. Also, LOVING the cheaper tote option. I too love the Madewell one, but can't justify $200 on it! This post is amazing. Amazing. Perrrrfection Tracy! (And I just made it to your actual blog...friend fail).